The idea was simple… what if we could get millions of people to engage in simple acts that were good for the world? Picking up litter, helping the homeless, smiling, planting a tree. And, in doing so, we would make the world a better place and also help people understand how much and why they matter. 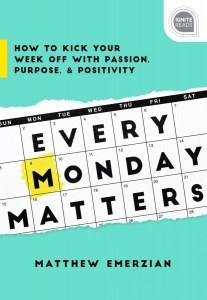 Every Monday Matters is a practical guide to life which kicks off each week with a specific and engaging themes to help the reader get inspired and live authentically.